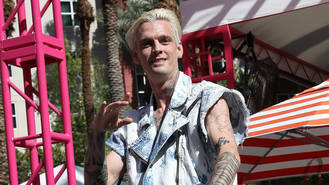 Aaron Carter's family and friends are reportedly worried the star is about to relapse after his recent behaviour. The I Want Candy singer's recent behaviour, including a car crash earlier this week (4Sep17), in which his car was totalled, has caused some concern for his health and mental well being. In 2001 he was admitted to rehab for an addiction to inhaling aerosol spray from cans that are used to clean keyboards. According to editors at TMZ, family and friends of the star are keen to get the 29-year-old singer help before he relapses or hurts himself. The former child star has reportedly been worrying those closest to him telling them he "can't take it anymore" and that he is "losing it", and as a result they're worried he might be on the verge of a mental breakdown. TMZ reported his family were behind at least one of the calls that were made to St. Petersburg Police Department earlier this week. One caller allegedly told officers Aaron was threatening to take Xanax and Klonopin. TMZ also reported earlier this week that an anonymous caller claimed the 29-year-old needed psychiatric evaluation because he was refusing to get medical help following his car accident on Monday. Family and friends are reportedly worried the star has spiralled so far out of control that he might attempt to take his own life. These concerns have arisen after he has reportedly been hinting at suicide for the past few months. The source also told the entertainment news site that the Crush On You singer has been inhaling aerosol spray again. Aaron's family are believed to be desperate to get him back into rehab and are seeking legal advice on what steps to take next. Harry Styles feared a recent wrist operation might prevent him from playing guitar on his upcoming U.S. tour. Bradley Cooper's Guardians of the Galaxy alter ego Rocket Raccoon is getting his own origin movie. Demi Lovato has held back some heartbreak tunes because she could never release a track that hurt someone. Joe Jonas wants to create a safe place for fans at DNCE gigs. Sinead O'Connor called Dr. Phil McGraw when she was going through a "difficult time" recently. will.i.am is hoping to change the music industry by joining "revolutionary" Swedish mobile record label Amuse. Selena Gomez has taken to social media to share a rare snap of herself and The Weeknd. Lady Gaga has gushed about her new boyfriend Christian Carino at a New York concert, telling fans she is "in love".